Hallet Peak basks in the glow of first light at Lake Haiyaha. The early morning sun is just peaking over the eastern plains of Colorado lighting Hallet peak with a soft pink glow. 'Haiyaha' is a Native American word which means 'many rocks'. 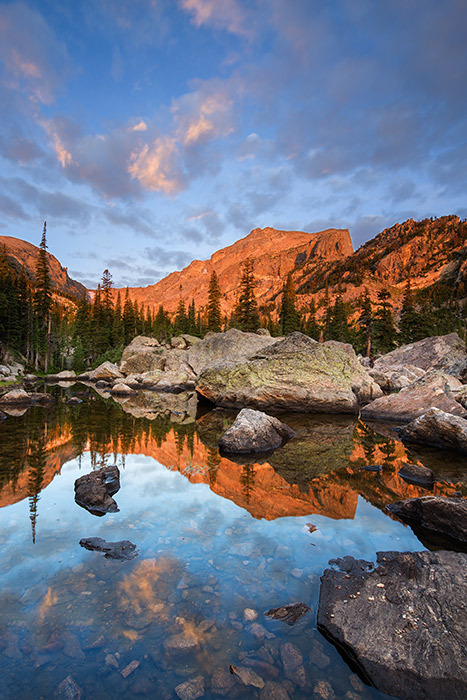 It's will be quickly apparent to vistors and hikers of Rocky Mountain National Park how aptly named Lake Haiyaha is. Photo © copyright by Thomas Mangan.